Without realizing that much, it's been my 4th day in Durham as in on the 29th of May. 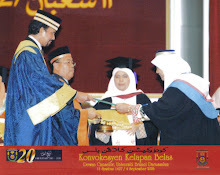 Alhamdulillah, syukur kepadaNya, aku selamat sampai di tanah Durham kira2 jam 3.00pm 26 haribulan Mei 2009. Perjalanan daripada Brunei ke London yg memakan masa 16 jam, 8 jam (Brunei-Dubai), transit setengah jam, 8 jam (Dubai-London) jika pemergian ku sebelum ini dipenuhi dengan keindahan trajedi lebih2 lagi ditemani rakan-rakan seperjuangan dan insan2 yang disayangi tetapi buat pertama kali sepanjang hidupku, aku tabahkan hati, berbekalkan semangat dan mengenangkan impian, kali ini aku jejakkan kaki menuju ke kapalterbang bersendirian. Memandangkan hari tersebut bukanlah musim cuti sekolah, dapat dihitung dengan jari berapa ramai orang Brunei yg berada di flight yg sama. I'm not that good in making friends, lebih2 lagi dengan org2 yg tidak dikenali.. Tapi alhamdulillah during the transit in Dubai, a guy approached me and kitorang set la nk deal with the heathrow immigration post sama2.. whoppsss don't get me wrong, that guy is married okay. It's just that he realized out of all the passengers, sah2 I'm the only obvious Brunei Malay yang pakai tudong.. haha.. So, since it was his first tym in London, after his first visit long, long time ago when he was still a kid, so, I offered my help to go and search for the train area in heathrow, where I'll be finding my own way to the underground station as well (although it was actually my first time!). Rather than doing it alone, I feel quite secure having a friend with me. Thank you ALLAH for the meeting with the new friend. Phewww... until today I keep on thinking how I survived the long dreading moments, ALONE! 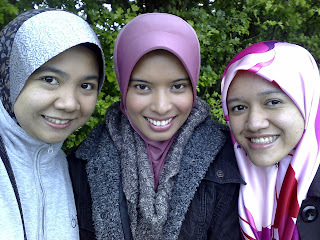 Then it also reminds me of Nurul, a bestfren of mine, who survived most of her time alone while studying in Leicester 2007/2008. 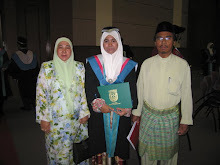 I inspired her courage so much and that's why I guess I took the risk and dengan berbekal Tawakkal dan doa2 insan2 tersayang, I made it through the first phase of my "new life". There are so many things I regret doing, obviously bringing too MANY luggages along! Yeah ended up with sore palms and sore muscles but hey I am happy I went through it all. The first challenge was the struggle to hop into the tube and then not manage to find the nearest seat to my luggages. To stand for the long moments, I just couldn't. I was so tired. So, I just hope and pray my luggages are fine. There are so many people and the tube got crowded. All I could do was pray that nobody would steal my bags! I was worried, plus worried that I couldn't do anything about it. Too limited space! Then only after there are 3 stations to King's Cross's, there were fewer people left and I am relieved that my bags are still there although it somehow fell from the first place I put them on. Alhamdulillah all bags are safe! Arriving safely to the passengers' lounge at King's Cross was the second happiest moment after the first being put through at the immigration control of heathrow. The officer was so strict and UNFRIENDLY, daym! She just don't seem to have any pity and LITTLE understanding of my situation. Thankfully she finally gave up the chop with a warning that I shouldn't try to get a job while being in the UK, in which of course I wouldn't! I arrived securely at King's Cross train station earlier before the departure tym of my train to Durham which was at 11.30am and expected to arrive in Durham at 2.30pm. Arrived at bowburn around 3++pm. My arrival and presence were actually kept secret and only known by Kam, my housemate. Just want it to be a little surprise especially for kak nur who kept asking me and wondering when I'll be home. I dun wanna actually bother her that much since she's enjoying her trips with her parents, all around Uk and Europe. So, luckily that dat she was out with her parents. I hide in Dijah's bedroom. So, when K.Nur arrived she didn't realized anything and she SCREAMed out my name when she saw me! hehehe.. kejam x aku? Also, wanna take this opportunity to say TQ to Dijah for lending me her room. 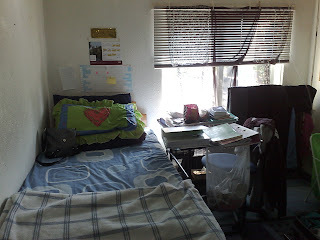 Plus I actually felt guilty when K.Nur's parents felt guilty for using the room downstairs when I am actually already in Durham. I dun mind actually. I can even stayover at Kam's room. 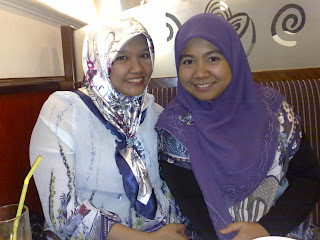 Kan Kam ;o) Then for dinner the same day, Amalina came as well and she wasn't as surprise because she somehow expected it.. hehe.. I'm so glad and happy to be with familiar faces! 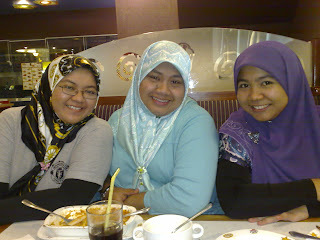 The next day, me, Kam and Amalina went down to ITS and city center.. Wahh.. 3 months not being there, nothing much change except the fact that there are certain shops yg tutup sudah.. like kedai barrats and bay is closing down! Thank GOD Durham's Whittard survived whereas other 45 branches were closed down. I simply love the bowls and mugs! 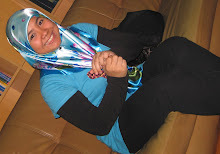 Ohhh btw, this was also the time ter-kantoi to Lutfi dat I was back in Durham. He saw us walking to the city while being in the X1 bus.. Haha.. Sorry lah Lutfi, aku je yg xnak bagitau sesape dat I'm back. No other reasons. Anyway, also would like to tell my fellow friends "THANK YOU" for sending me off at the Brunei International Airport walaupun I know you all are actually busy. Especially to my family, TQ, I LOVE YOU ALL!! I'M MISSING ALL OF YOU Ma, Pa, Jana, baby Irfan, Sisters & Brothers. I MISS HOME. 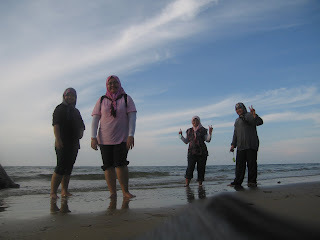 Okay, dat was Saturday Night, the day before.. Friday May 22nd, we (Zeah & I) arranged a mini gath at Pantai Muara for almost ALL our x-coursemates just to get together after such a long time not being able to. 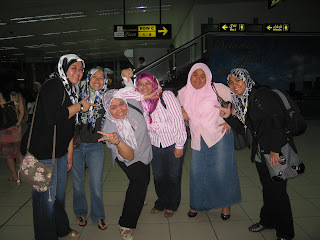 However, only SOME could attend.. some which includes Myself, Zeah, Nurul, Allyn, Kamal, Hjh Mimie n sis, Masriatol n cuz. hehehe.. I know!! it is for sure a MINI gathering.. HOWEVER, we still had fun.. so much fun, seriously!! Ohh thanks to Noha as well for sponsoring food. TQ sanggup hantar ke rumah pagi2, in which, I was really touched. I am not blaming anyone for not coming coz I knew that they are busy with other things. Some msged us that they can't make it to the gath, some fb-ed. No worries, I understand, no harm done =) As much as we want them to come, I also knew how much they wanted to be there. After all, it was a success. TQ for the chicken zeah! Berjaya jua BBQ tani!! Miss you already! Therefore, I guess these are all for now..
Oh, didn't I share with you all that I lost one of my cats a few days before my departure as well =(.. Then zeah also lost one of hers.. Then one of my cats gave birth to new babies.. Well, although I really love the cat I lost, I avoid being so sad. I was preparing to be even sadder leaving my family. Especially my grandparents (my mom's side) who are not that well. I told my grandmother about my departure, on that very day I am flying off. I can't hold back my tears. I was so weak that moment. . I miss them already. *sigh* I apologize to my family members: aunts n uncles, cuzzies for not telling them I'm flying off to the UK. I have my own reasons for that and let that be only me that knew. I'm so SORRY..
Akhir2 ni, mata ini seolah-olah berlatih untuk mengikut waktu UK semula. I have not been sleeping earlier than 1, 2 or even 3++ am. Mata ini seolah-olah mengerti bahawa tidak lama lagi aku akan kembali ke Durham, UK untuk meneruskan perjuangan di dalam pembelajaranku. Ya teman-teman di Durham, aku akan kembali berjumpa dengan kamu, kamu yang telah sekian lama mewarnai hidup ini sepanjang keberadaan ku di bumi Durham di hujung tahun 2007 hingga ke awal tahun 2009. ALLAH S.W.T telah sekali lagi memberikan kita peluang untuk bertemu semula, insyaALLAH. Selain itu, hal2 lain yg ku sibukkan di akhir-akhir ini adalah membeli belah barang-barang untuk keperluan ku di sana kelak. Ini kerana aku pergi kali ini di atas pembiyaan ibubapa ku.. Maafkan aku ayahanda & ibunda kerana terpaksa menyusahkan kalian. Selagi hayatku di kandung badan, selagi umurku masih panjang, insyaALLAH akan ku balas jasa kalian sepertimana yg kalian telah baktikan kepadaku. Ya ALLAH, panjangkanlah umur ku serta umur kedua org tua ku ini agar aku masih dapat berbakti kepada kedua-dua mereka, AMIN..
Selain daripada itu, aku risau dengan penyakit H1N1 yang melanda dunia ketika ini. Membaca blog lutfi yg terkini, aku risau barang2 di dalam beg ku akan diperiksa sepertimana yang terjadi kepada dia. Ya ALLAH, jauhkan aku daripada semua itu! Kini aku hanya mampu berdoa, berserah dan memohon kepadaNYA yang maha mengetahui dan memahami segala apa yang tersirat di dalam hati ini. Hari ini zeah mengajak untuk menonton wayang namun aku benar2 tiada kekuatan untuk pergi bersuka ria hari ini.. mungkin kerana aku lambat sangat tido semalam. So, hari ku dipenuhi dengan sesi membasuh pakaian, untuk memastikan pakaian ku kering dan tidak banyak yang perlu ku sisipkan kepada adikku untuk di basuh setelah pemergiaan ku tidak lama lagi. Ohh btw, pemenang American Idol season terkini sudah diketahui. Well, aku bukan salah seorang pengikut setia dan tidak kisah sesiapa pun yg menang kali ni.. so, hopefully para peminat American Idol berpuas hati ya. Ohh ingin ku titipkan ungkapan good luck kepada my housemate in Durham, Kam, for her coming exam. I think ada beberapa paper yg perlu dihadapi kan selepas ini? See you soon my dearest Durham friends! Bertemankan dendangan lagu2 di dalam playlist, ku gerakkan jari jemari ku untuk coretan buat julung kalinya di dalam blog yang ber"tagline"kan..
Bukan bermakna kehidupan ku 25 tahun yg sebelum ini tiada yang indah, terlalu byk yang indah, namun masih banyak lagi impian2, cita2 di dalam kehidupan ini yg masih perlu dicapai dan digenggam..Doa ku moga2 suatu hari nanti ku akan dapat juga merasakan kehidupan sepertimana yang di impikan, Amin..
Aduh, terlalu banyak celoteh ku.. berbalik semula kepada cerita yg terjadi semalam.. yup, it's 1.52am in Brunei dan sudah pasti cerita untuk hari ini belum bermula lagi. Therefore diganti saja dgn yg 20 May punya cerita.. The day started macam biasa2 dengan routine harian and it all gets more exciting when I received sms dari Zeah (ohh sesi mengenalkan, kot2 ada pengikut baru blog ini.. zeah is one of my bestest frens) bawa melepak dat afternoon. 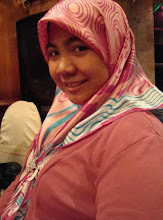 I accepted her offer and we went off to The Mall in Gadong, catch up with the week's story at the same time having our late lunch at the Mall food court. Dek terlalu lapar, x sempat nak tangkap gambar makanan hehehe. The session went on and on from eating lunch to crepes. Oppss zeah, you forgot to buy your ice cream la (baru teringat skarang ni) hehe. Btw, the session continues wif a karaoke session. Best la dgr zeah nyanyi.. (missing those karaoke sessions back in Bowburn). We had like 10 songs in a row.. yeah, percaya jgn x percaya! 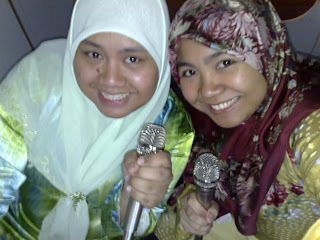 Here's a picture of us wif the microphones hehehe.. Ya ALLAH, tanpa di sedari betapa cepatnya masa berlalu and guess what? I will be leaving behind my family and friends and cats again in Brunei while continuing to pursue one of my dreams. 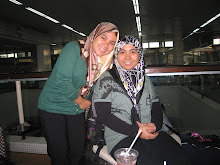 Oh yea Kak Nur, insyaALLAH you'll be there when I arrived. I've been missing you too.. It's going to be sooner than you all could have thought. But hey, to all those who knew, do keep the date a secret for me yeah. Thanks! Okay2... no more sad story allowed in this post! hehe.. Ohh btw all, I have a current addiction towards a new shining star.. wanna know who? 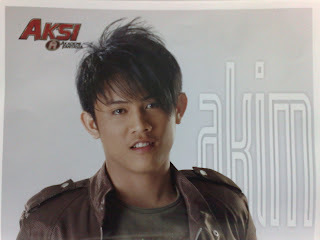 Bintang baru seberang laut @ Malaysia hehe..
the Akademi Fantasia season 7.. Honestly, I'm an addict towards his singing performances..
and also keep supporting him Gafimmers! 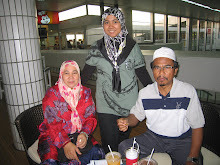 Arni di bumi Brunei Darussalam.